Yesterday Harry Winston bought the “Martian Pink Diamond” for $17.4 million dollars at the Christie’s auction in Hong Kong, during the Magnificent Jewels Sale. It is the largest pink diamond to ever sell at auction. It was owned by a private collector and originally owned by Ronald Winston in the 70’s. It was said to be named the Martian Pink, because in 1976 the United States sent it’s first satellite on a mission to Mars. Recently a very large 12.76 carat pink diamond was discovered in Australia, called the Argyle Pink Jubilee Diamond. It’s the largest pink diamond ever discovered at Rio’s Diamond operations in Western Australia. 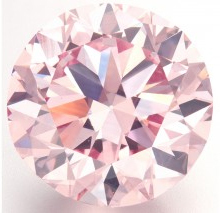 The Argyle Jubilee pink diamond, is similar in color to Queen Elizabeth’s pink diamond, “The Williamson”, which was discovered in Tanzania, in 1947. 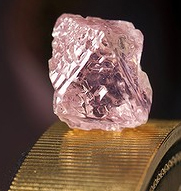 The Williamson pink diamond is ranked among the finest pink diamonds ever in existence. In a previous blog post, Huguette M. Clark had her 9 carat pink diamond pinky ring, sell at a Christie’s auction for $15.7 million. This entry was posted in Diamonds, Jewelry, Jewelry History, Jewelry News and tagged christies, jewelry warehouse, pink diamond, pink jewelry. Bookmark the permalink.